Arthur Darvill reads this exclusive audio adventure featuring the Eleventh Doctor and Amy. When the Tardis lands on Orkney in the near future, the Doctor and Amy arrive to find a large demonstration in progress over the construction of new electricity pylons. The Doctor tries to break things up peacefully - but suddenly the road splits open without warning and swallows police, security guards and protestors alike. Separated from the Doctor, Amy takes charge of transporting the wounded to hospital - but the rescue mission becomes a terrifying ride as the pylons come to life and begin to walk and the road rears up, erupting with boiling tarmac...The Doctor, meanwhile, has even more than metal monsters and rebellious roads to deal with. Who is sucking the life out of the power company's employees - and just what is lurking inside the Astra-Gen headquarters? 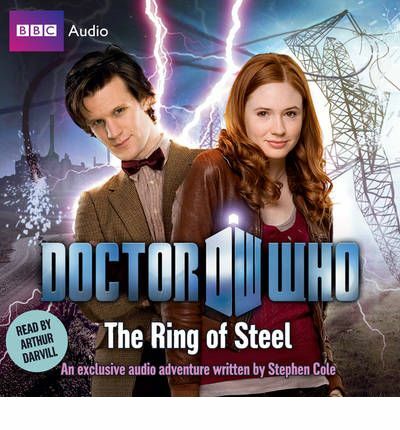 Written specially for audio by Stephen Cole and read by Arthur Darvill (Rory in the TV series), "The Ring of Steel" features the Doctor as played by Matt Smith in the acclaimed hit series from BBC Television.